The best legal mechanism to protect the environment re-mains a complex and contentious issue. Many normative questions with practical implications remain. Should the legal response be in the foundational document of most legal systems, the Constitution? If so, should a Constitution create a specific right to environmental protection, or are statutory responses to address environmental problems adequate? If one considers environmental protection globally, both constitutional and legislative responses to environmental protection prevail. Yet, neither alone is adequate. Environmental legislation may not cater to individual rights, especially when legislated from a utilitarian platform. A constitutional right to environmental protection can protect individuals from environmental harm, but does not necessarily correlate to better or stronger environmental protection. Consider the examples of the United States and India. 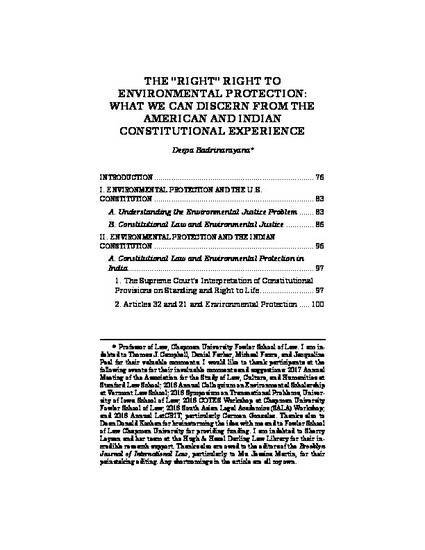 Deepa Badrinarayana, The "Right" Right to Environmental Protection: What We Can Discern from the American and Indian Constitutional Experience, 43 Brook. J. Int'l L. 75 (2017).